Here’s How Celebrities Reacting For Ajith Kumar’s Press Release !! You Just Can’t Miss !! Popular Tamil actor Ajith Kumar on Monday categorically emphasised that he has no intentions of joining politics “directly or indirectly”. The actor, whose films are known to command good openings pointed out that he disbanded his fan clubs and avoids making political statements through movies to ensure that they were not politically associated with anybody. He asked his fans to exercise their political affiliations in their individual capacity. “I have my own likes and dislikes in politics. I have never imposed my political views and I expect this from my fans as well,” he said. Nice to see #Ajith gracefully say that he would stick to the movie world and will not try his hand at politics. At a time when many stars are keeping people guessing about their possible political entry in order to retain the buzz around them,Ajith is a refreshing change.Kudos. None other Than Thala #Ajith Sir ! 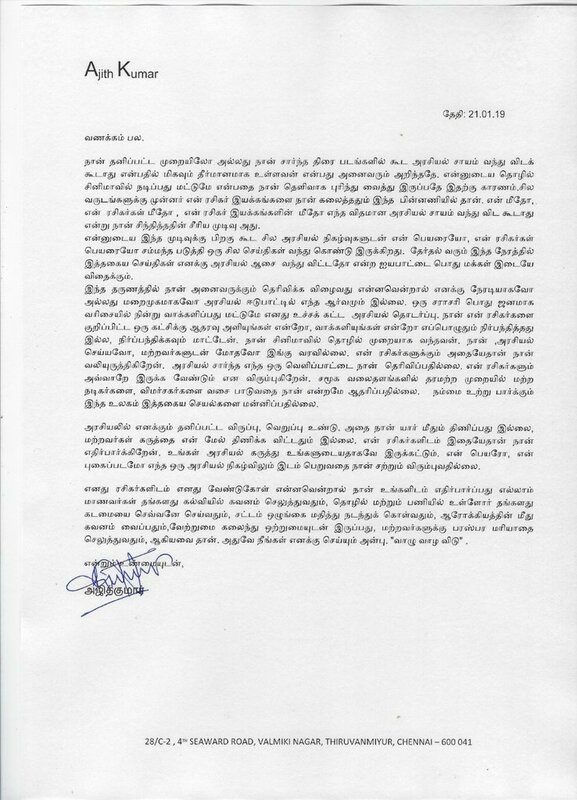 Man of true class #AjithKumar .. his open letter is indeed a true reflection of his free spirited personality .. This is exactly why #Thala is an amazing Role Model – An example to follow !! Comment your views on Ajith Kumar’s Stand !! Previous articleMASSIVE UPDATE : This Successful Actress To Pair Up With Danush In Vetrimaaran’s “Asuran” !! Check Out !! Next articleCheck Out The New Short Film Directed By Jason Sanjay, Son Of “Thalapathy” Vijay ! !